I always try to read my latest blog post the morning after having posted it. More often that not there is a typo or two that needs fixing and I seem to catch those more easily when fresh in the morning rather than at 10pm when I generally hit the ”publish” button. What I noticed more than anything else when I did the morning-after review of last week’s post, was the way that the picture of Maxima’s ch’uspa gleefully jumped off the page. Those festive reds, oranges and pinks and joyful greens rang out as I scrolled down the page. It is not hard to understand why Maxima should want to use the synthetic thread in these bright colors for her husband’s outfit as Mayor of Huancarani as her aim is to create something festive. In the same way, she and other weavers in her co-operative have started working on their llicllas for Carnival next year and are using acrylic yarn in bright colors bought in the market. 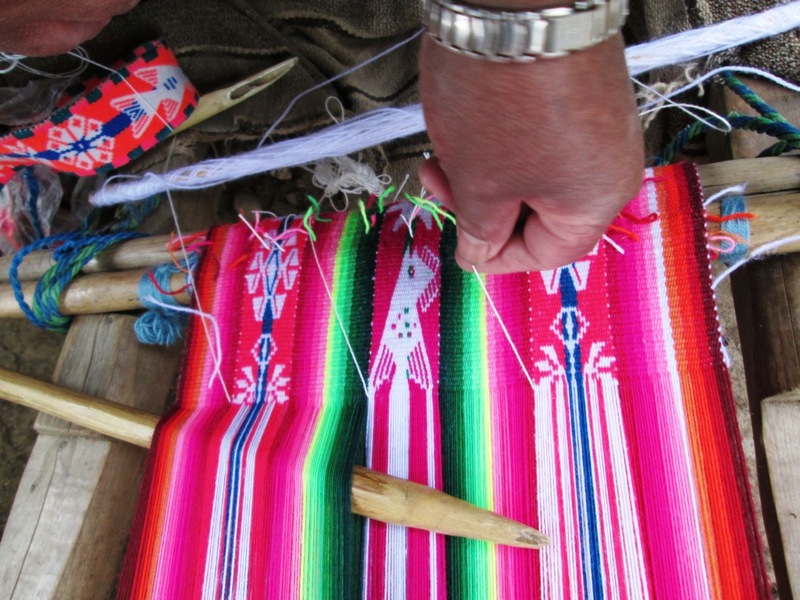 There is still work involved before the pieces can be warped as the bought yarn needs to have more twist added so that it will stand up to the abrasion of warp-faced weaving. 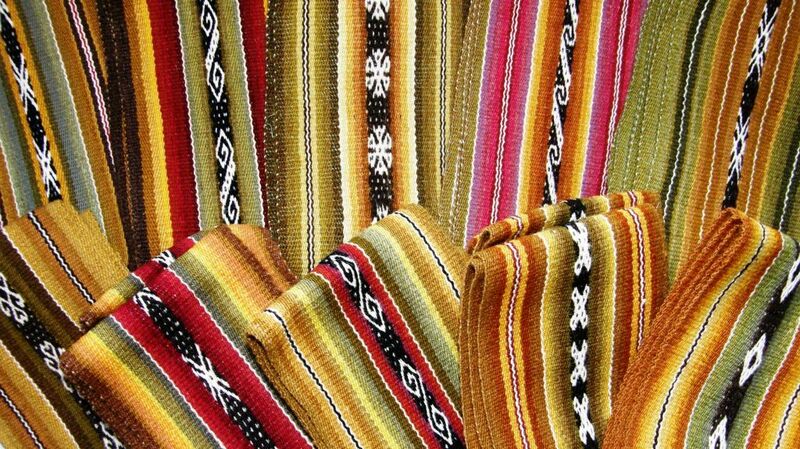 While the weavers are able to obtain beautiful deep shades of red using natural substances like cochineal, most colors they get from natural sources tend to be much more muted. 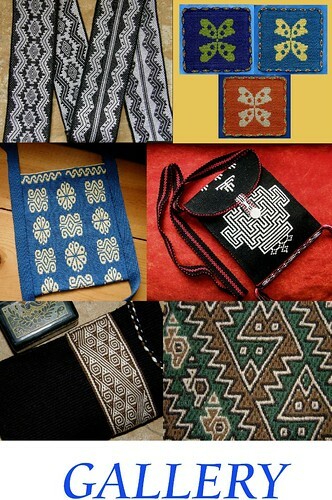 Natural whites are not as brilliantly white as the synthetic whites either and these weavers are not using indigo to obtain blues. The hairiness of the handspun wool creates slightly more ”subdued” motifs next to the sharp, crisp ones woven with synthetic yarn. 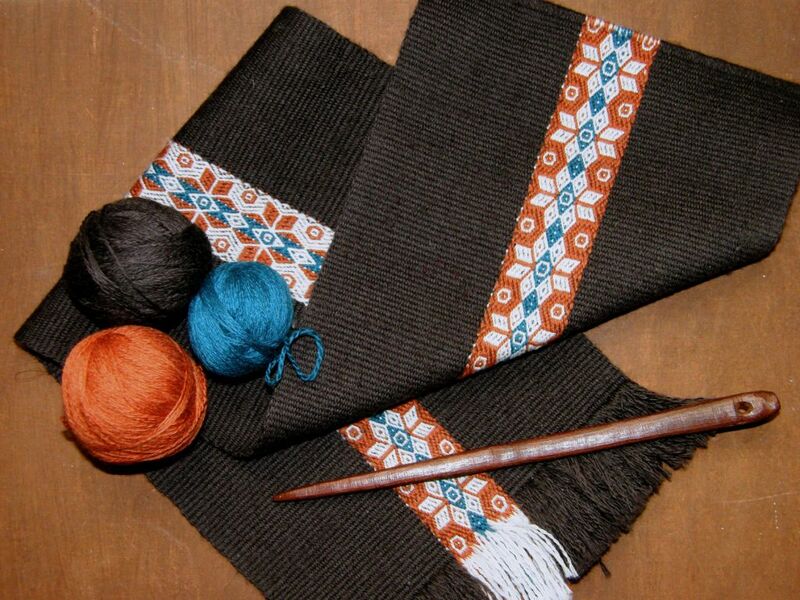 However, we, in the western world, love those natural dye colors and the way they so perfectly blend and work together and we tend to choose handspun wool textiles from indigenous weavers over synthetics. 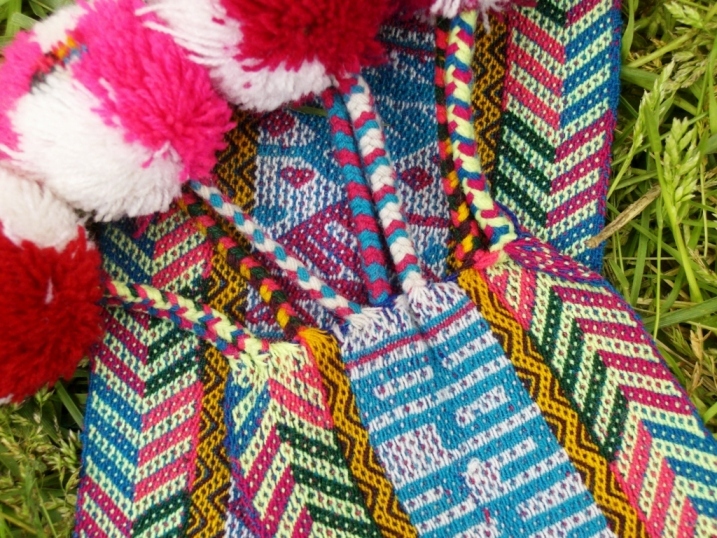 It is even easier to understand the weavers’ leanings towards these bright colors when you see the rather bleak and colorless landscapes at some of the higher altitudes of Bolivia. 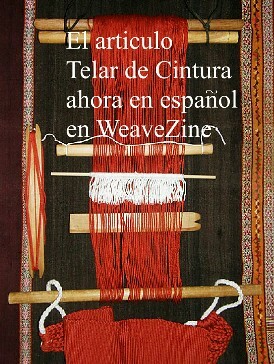 When I studied with weavers in Potosi, Bolivia, I shopped with one of my teachers for the yarn that we would use. I had her make the color choices as I wanted something that represented her taste. Her sister, however, turned up her nose when we had finished warping! She might have liked the colors but she definitely didn’t like the way in which we had arranged them. You can see how the woven piece is a spot of cheery brightness against the hard baked dry earth and stone walls of the patio. Of course, there is lots of pink. 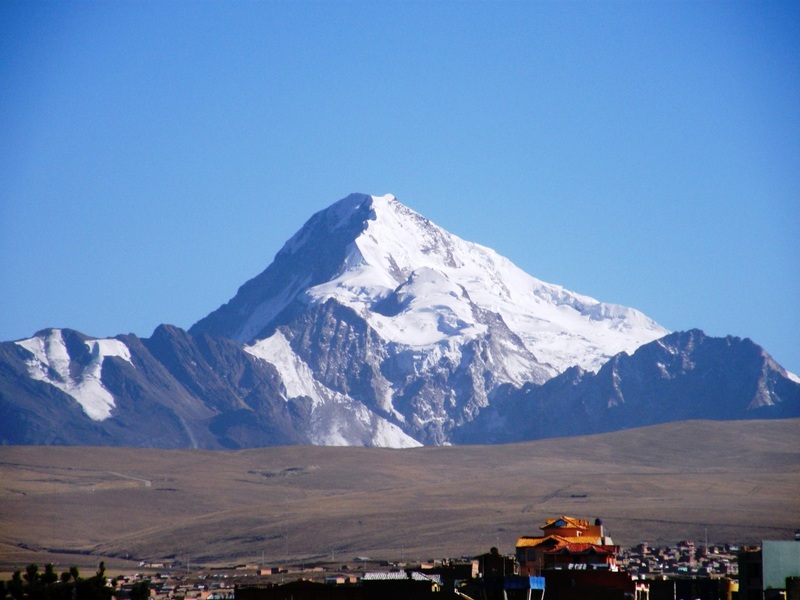 I remember the first time I visited Taquile Island on Lake Titicaca in Peru in 1996. 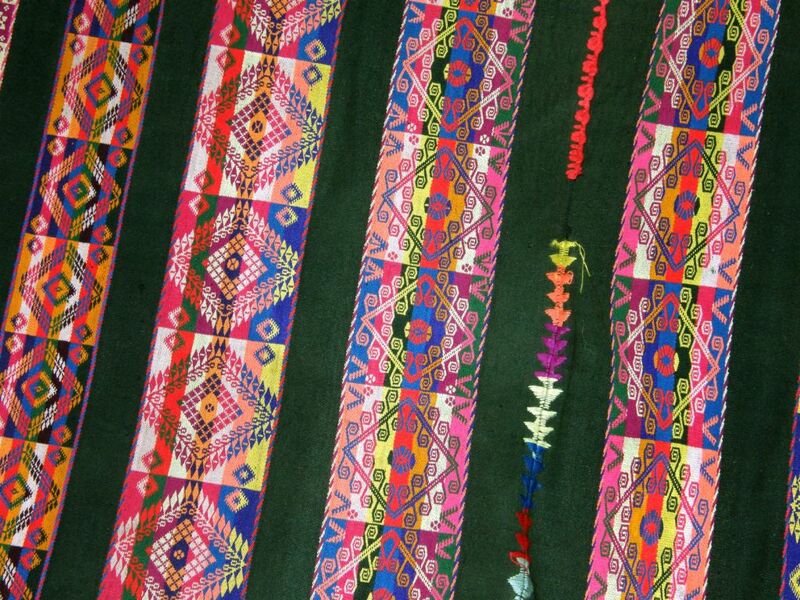 I wanted to buy a textile from the market in the plaza and kept turning down pieces that were synthetic. Yet, these were the pieces that had the most beautiful work of all. The synthetic thread was extremely fine and allowed the weavers to create double weave motifs with an incredible amount of detail. The motifs in brilliant white stood out boldly and crisply against backgrounds of ruby red and green. 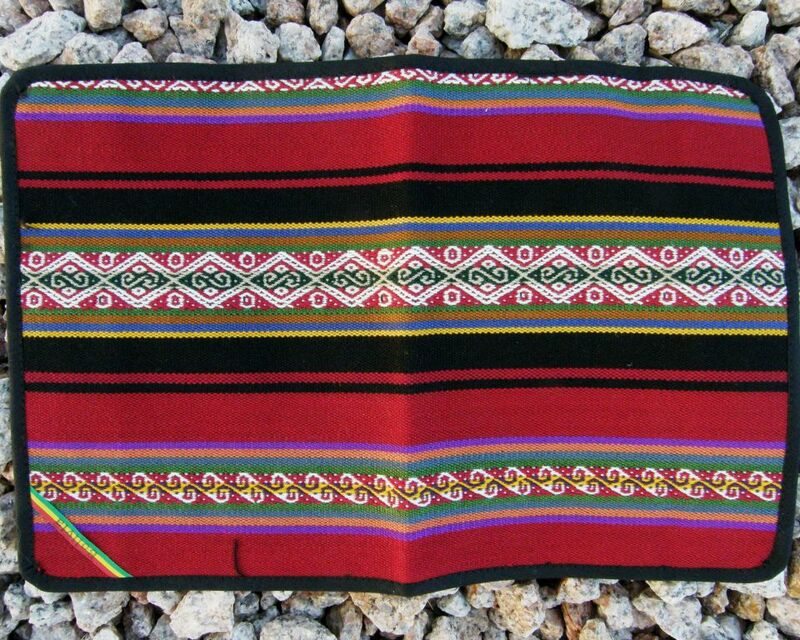 I absolutely love this Bolivian poncho made with exceptionally fine synthetic thread that a friend of mine bought in a textile store in California. The amount of design detail that has been packed into the narrow bands of color is extraordinary. The weaver has used some of the typical strong pinks and yellows alongside much softer tones in the columns of double weave. 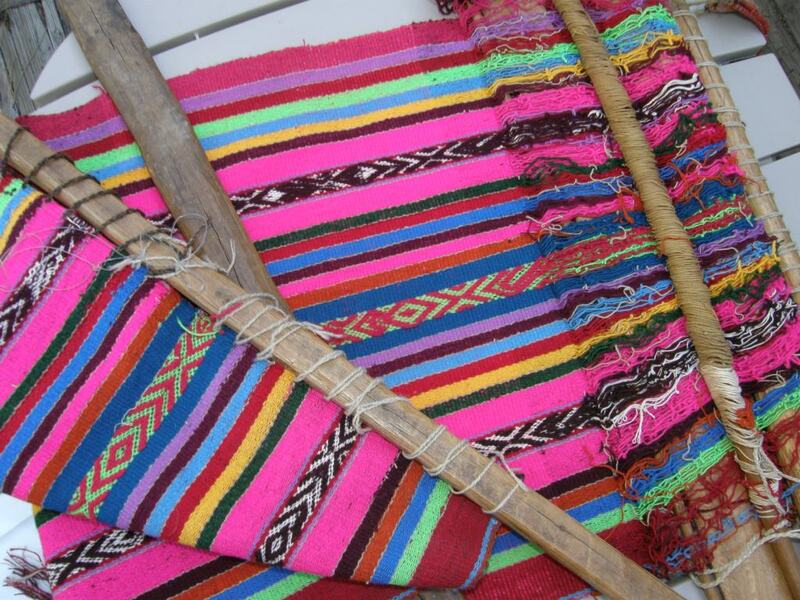 Sometimes, synthetic colors are used alongside undyed handspun wool such as in this piece from Peru…. Synthetic dyes are sold in the highland street markets. It is lovely to see the mounds of colored powders in rows on the tables next to old weighing scales and sheets of paper for wrapping the purchases. 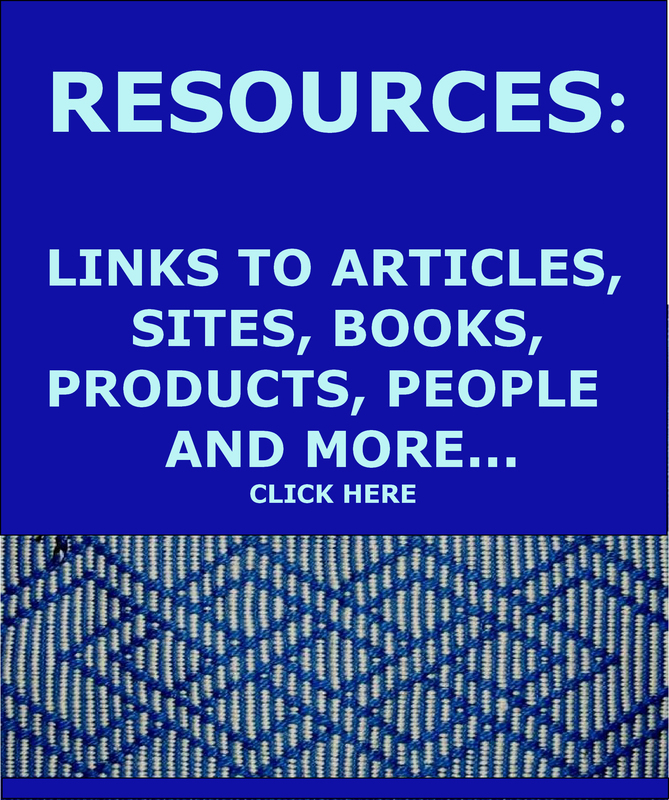 Handspun wool can then be easily dyed for colorful woven bankets and carrying cloths…. 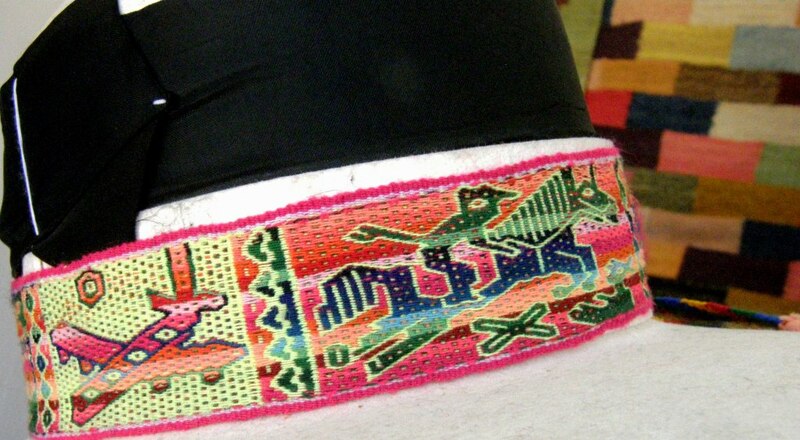 Bolivian hatbands, decorated with colorful acrylic supplementary weft threads, are woven with warp thread that is finer than sewing thread. 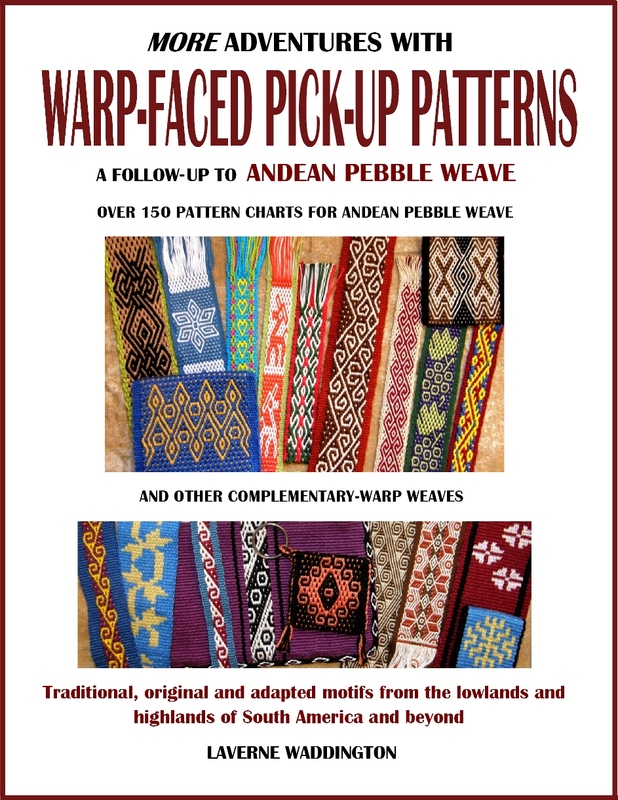 This fineness allows the weavers a lot of flexibility in their motifs with weft floats that can span up to 20 warp threads without being too long and cumbersome. I doubt that anyone is taking the trouble to spin yarn that fine anymore. 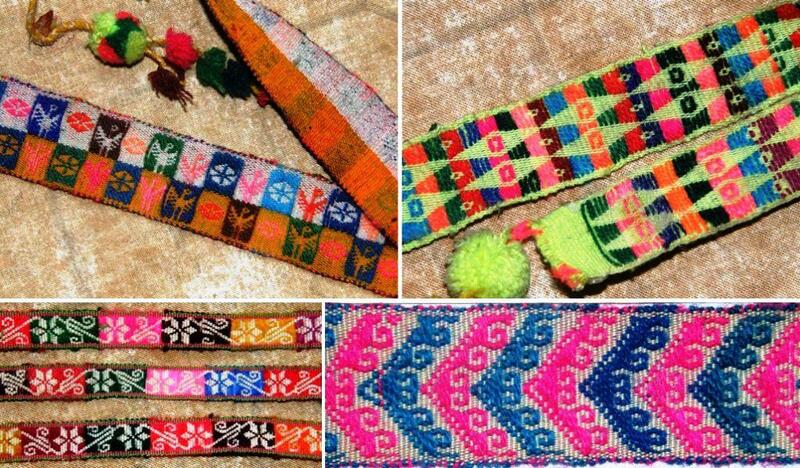 The bright colors, tassels and pom poms give these bands a very festive look. 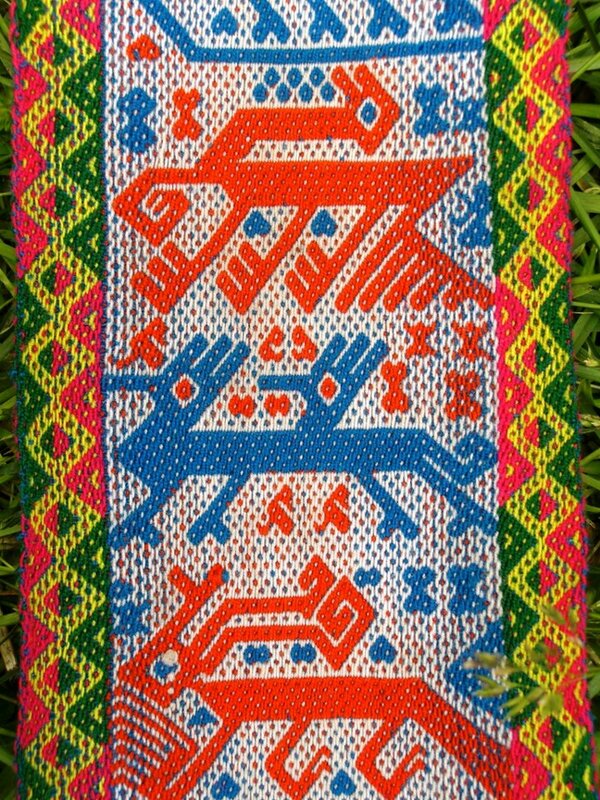 When I show people examples of Peruvian and Bolivian weaving, I place this next piece of cloth alongside samples of handpsun wool, wool weavings and my own work. Many people are immediately attracted to this piece. 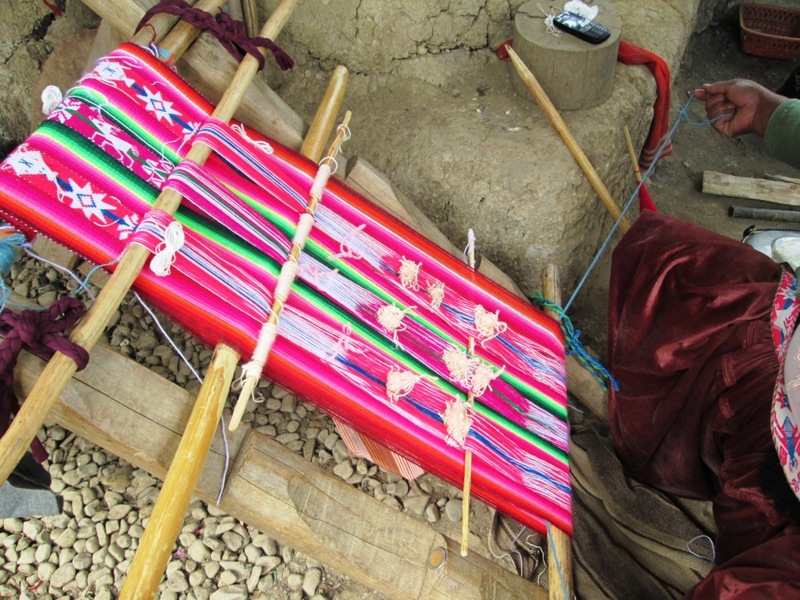 It is, in fact, a machine-made acrylic version of traditional weaving patterns of Chinchero, Peru. 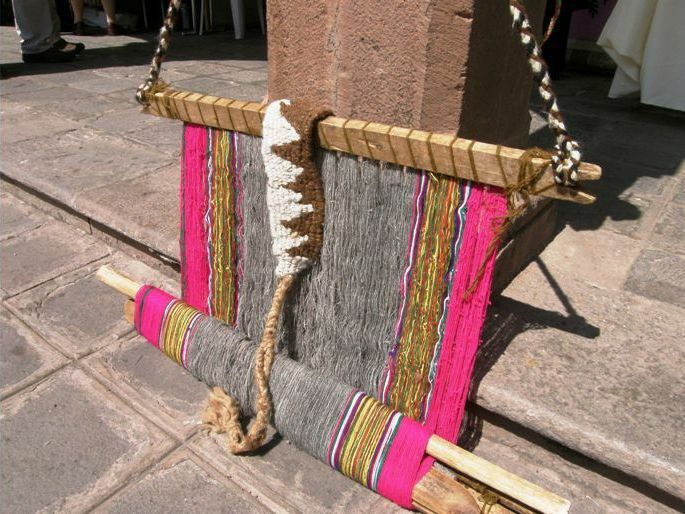 The weavers of Chinchero, of course, weave with their handspun and naturally dyed wool yarn. I don’t know where this piece was made, having bought it in Santa Cruz airport. You all must know by now that I adore the use of red, black and white in textiles. For me it has a sort of ”tribal” flavor. 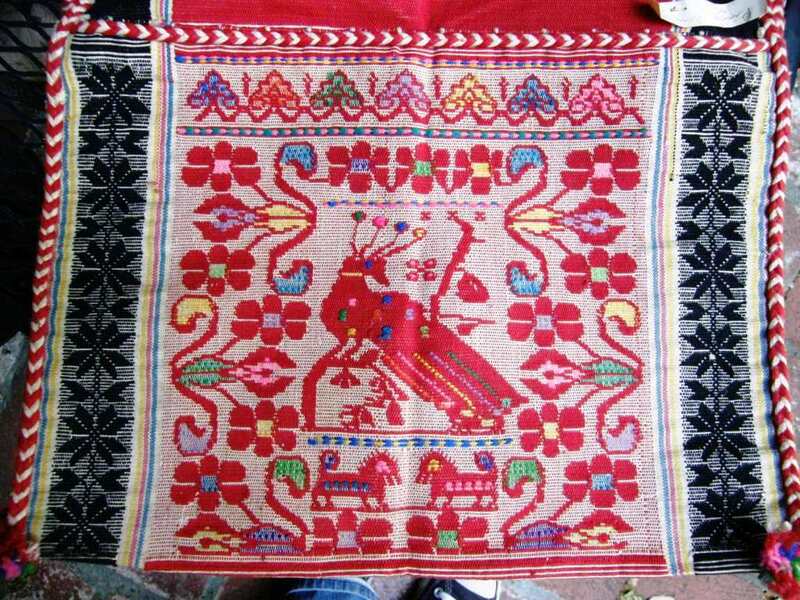 The inclusion of bright acrylic supplemental weft in this red, black and white saddle bag from northern Peru gives it a completely different flavor, I think. As for me, I remain conservative in my color choices. I took a slight detour this week by using orange. I found a nice burnt orange wool on my last trip away and I wanted to try out this new wool yarn to see how it performed in the grip of string heddles and warp-faced weaving. I used it, along with the other colors, straight off the skein. It is wool. Therefore, it was hairy and gnarly in the heddles and sticky. That’s its nature. There are ways to deal with that. Each type of yarn calls on a different strategy for opening clean sheds and avoiding excess abrasion and breakages. I had to be careful to advance the warp often so that the heddles were not sitting too long on one spot and causing a lot of friction on that one part of the warp. No threads broke and the resulting cloth is gorgeously soft! 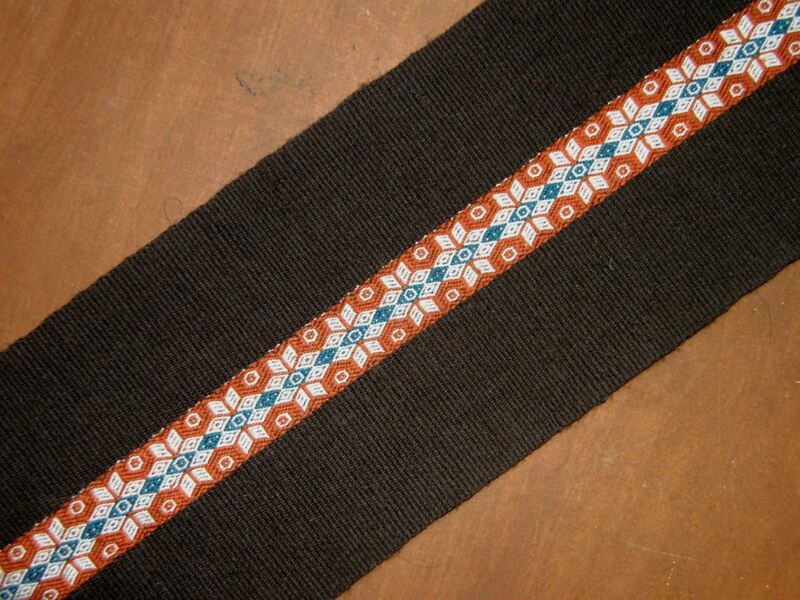 I am currently planning and sampling a tubular band pattern that will suit the motif. 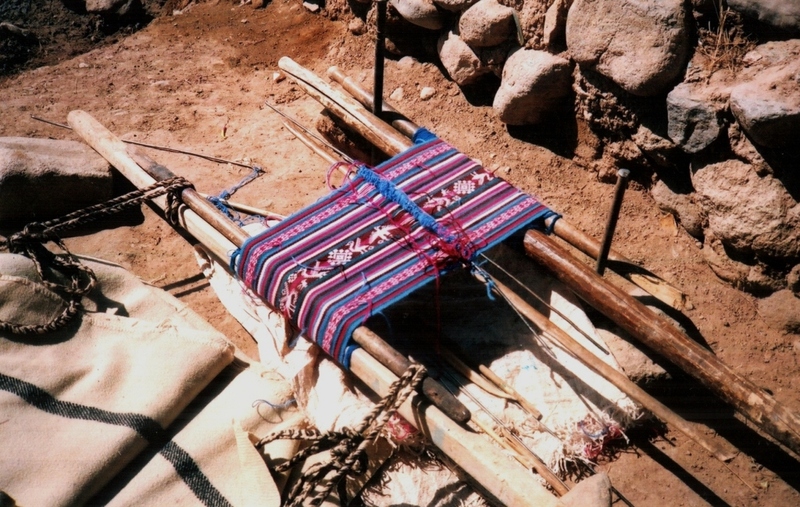 The purpose of this weaving was to test the wool. It was a success and so, I shall make something with the cloth and, at the same time, try out my own tubular band pattern. Ths is the first time I have used the motif you see above besides the tiny sample I wove for my second book. When I look at all the colorful weavings in this post, I am reminded of the machine-knitting business I used to have in my skiing days. In Australia, for every colorful patterned wool ear-warmer band that I sold, I would sell ten plain navy blue ones! It was a totally different when I spent the other half of the year in Europe. The Swedes in particular would wear wildly colorful hats with pom-poms that erupted from the top and cascaded down the sides like fireworks! The more colorful, the better and they were a blast of color in the snow. It’s interesting to note the different attitudes to color. And my ski suit? Well, there were a few but my favorite was, of course, black (with some neon pink bands). This was back in the 1980s. It’s a bit funny how we of the “rich world” come trouping in, demanding that artists of another culture stick to their old ways because we find them pretty and quaint. While they themselves evolve, include new materials and motifs (I saw the aeroplane), just as the rest of the world does, and should. While still honouring their old methods. That thing for the mayor really hurts my eyeballs, but I bet she’s as proud as a peacock over her colour choices. Thanks for sharing all this beautiful work! I can understand the desire/need for color when the landscape has so few contrasts. I live in the Pacific Northwest, and the first time I spent two weeks in the Phoenix area of Arizona I so craved color! My work was so much more colorful for while after I got home. Great post, Laverne! I have to agree with the ideas that bright colors cheer up a bleak landscape, and that super-skilled, wonderful work executed with synthetics can be just as compelling as the natural dyed, handspun work. I bought a brilliant camel bag from the weaver I knew in Qatar, which she had woven 15 years before. The work is very fine, and I know she’s not doing that type of work any more. It’s all synthetic, with bright, brash colors and even some silver metallic yarn – normally not to my taste! 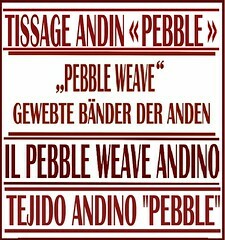 But the skill and detail are magnificent, and her handspun is at least 4 times as thick as the synthetic commercial yarn with twist added. 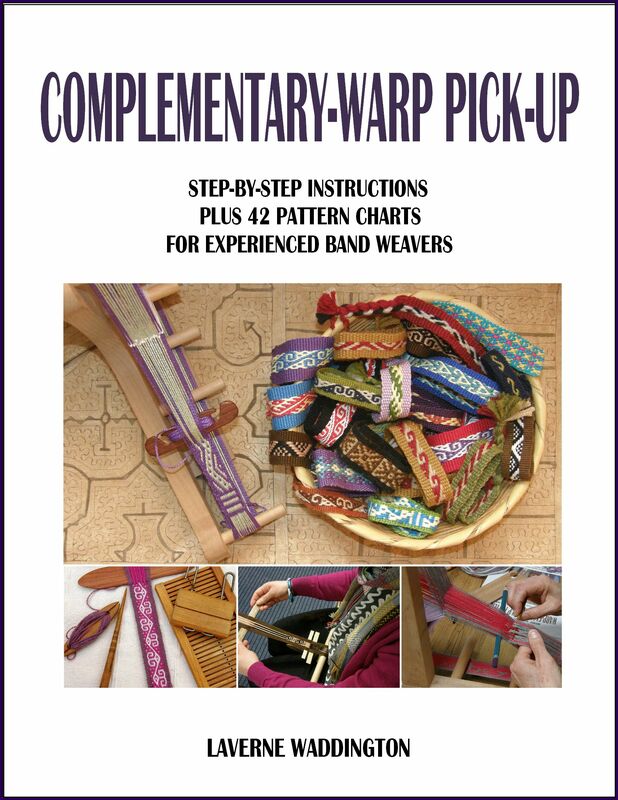 Your post makes me itch to get my weaving set up!